The windows on the south wall depict the sacramental life of the church in seven series of two windows each. 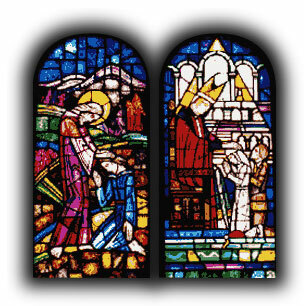 One window in each series portrays the biblical aspect of a sacrament. 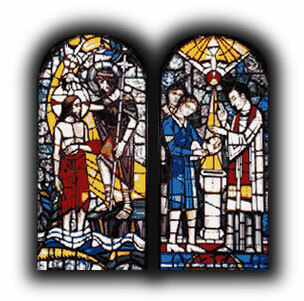 The other window shows the modern day usage of the same sacrament. 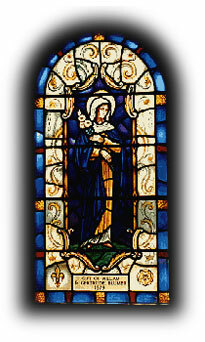 Window at left is at the north side of the altar and represents the Virgin Mary. In left panel, one of the apostles anoints the sick as described in James 5:14. "Is there any sick among you? Let him call to the elders of the church and let them pray over him, anointing him with oil in the name of the Lord." 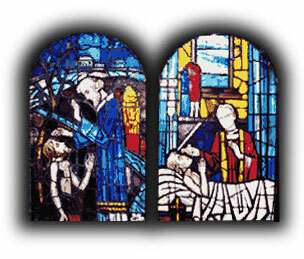 The right panel portrays a priest anointing a patient in the hospital. The priest bears the likeness of Fr. Gardner Vivian, who assisted at St. Andrew's during the 1950s and 1960s. The left panel shows John the Baptist baptizing Jesus in the River Jordan. The right panel shows Fr. Mason Frazell, the first rector of St. Andrew's, baptizing a child. The lady represented in the window is Lillie Adcock Roberts and the man is her son-in-law. 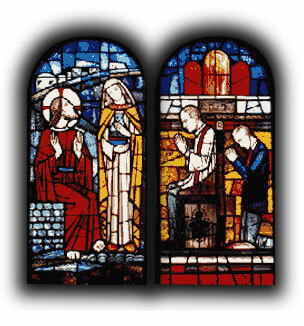 It is the only window in which there is the likeness of more than one person from church. In the left panel, Jesus is portrayed with the disciples at the Last Supper. 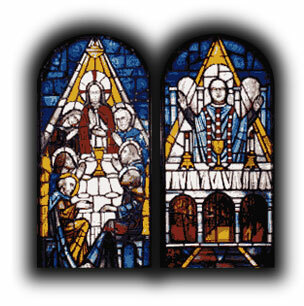 The panel at right is a representation of Holy Communion at St. Andrew's Episcopal Church. Fr. Garfield N. Brown, the church's third rector, is portrayed as the celebrant. 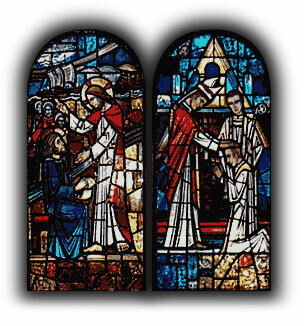 The left panel shows Jesus laying hands on those who were to have their faith confirmed as we think of the sacrament today. 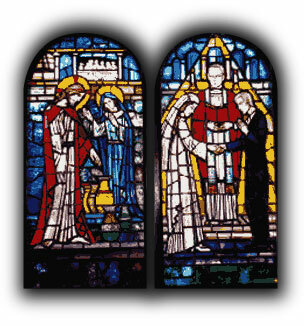 The right panel represents Bishop James Duncan, the first bishop of the Diocese of Southeast Florida, confirming two young people at St. Andrew's. The left panel represents the wedding feast at Cana in Galilee in which Jesus turned the water into wine. The right panel shows a priest solemnizing a marriage. The priest protrayed is The Rev. John Albert Edward Blackwell, a Canadian priest. He was Fr. Brown's uncle and instrumental in leading him into the priesthood. The left panel shows Jesus forgiving the Samaritan woman at the well (John 4:7-9). On the right, a priest hears a communicant's confession. The panel contains the likeness of Bishop Henry Louttit when he was a priest. He was once Bishop of the Diocese of South Florida and at one time served as priest-in-charge of St. Andrew's while he was rector of Holy Trinity in West Palm Beach. In the left panel, Jesus commissions the Apostles Andrew and Peter, represented by the boats in the background. At right, a bishop is shown ordaining a man into the priesthood. The bishop bears the likeness of Bishop John Allin, the presiding bishop at the time the window was commissioned.